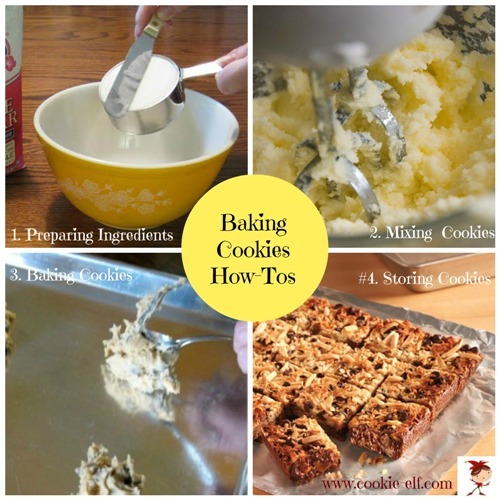 There are three practical kinds of cookie baking information to know to make cookie baking is as simple and easy as possible in your kitchen. The Elf’s tutorials, hints, and baking tips make it easy to measure, mix, bake, and store cookies. Prior to the twentieth century, recipes were simply lists of items. In reading a recipe, it was assumed that you knew what to do with the ingredients. Those assumptions are no longer part of the public’s collective knowledge. That is why this section of The Cookie Elf is dedicated to providing baking how-tos. Easy cookie recipes are helpful, especially when they are written in simple cookie language. (Pop over here for tips about how to read and follow a cookie recipe.) But even though today’s cookie recipes give a few more particulars than those in the past, every cookie baker likes clear instructions. Extra baking tips are really helpful, too! When baking you undertake different kinds of tasks. They are not complicated. With the right instructions and how-tos, they are really simple. These are steps you take to get ready to mix your dough, like softening the butter ahead of time and using the proper measuring cups and spoons for dry ingredients and wet ingredients. Collective baking knowledge says there is more to baking than simply slapping a pan in the oven. These how-tos explain how to prepare baking pans, how much dough to drop in a cookie, how to adjust your cookie recipe to accommodate for high altitude, and other valuable cookie baking know-how. Whether it is hints for cooling cookies, cutting them, or storing them, you can help keep your baked creations as fresh and neat as possible using clear guidelines.